Scott at Imperator Fish kindly lets us syndicate his posts. This one is originally here. 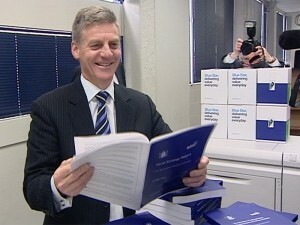 National have long been promising the people of New Zealand a return to surplus by the end of the 2014/15 financial year. But now Treasury are forecasting a half billion dollar deficit. It’s the worst possible news for Finance Minister Bill English. But let’s be fair to English. Is any of this really his fault? And should we even be concerned? Here are ten explanations, excuses or distractions Bill English might like to employ over the coming few days. This is only because of a drop in dairy prices. How could anyone possibly foresee that they would drop from historic highs? Did you think I said surplus? No, I said a return to the surface, not a surplus. I was referring to the vessels currently searching for the missing Malaysian Airlines plane MH370. I read somewhere that they were expecting to complete their underwater searches next year, at which point they would come back up to the surface. Maybe you ought to get your ears checked. I would point out that it’s only technically a deficit. Let’s not all get hung up on a few numbers on the wrong side of a ledger. Labour had nine long years to get the country back into surplus by 2014/15. Why don’t the media focus on the real culprits? We’re not afraid to make the tough calls. The fact that we have the courage to break such a fundamental election promise just proves we are absolutely the right party to lead New Zealand. We’ll be fine. Especially once we have passed urgent legislation extending the current financial year to December 2017. Numbers are so boooring. Why can’t we talk about something fun for once? What promise? There was no promise. The budget surplus thing was just an aspirational goal. Just like how we’d like the All Blacks to win the next World Cup. Good God, I’m only the Finance Minister. I can’t control how the All Blacks perform, can I? When I said 2014/15 I was just estimating. Like when you go to your mechanic and say “how much will it cost to fix my car?” and he says “three hundred bucks,” but he ends up charging six hundred bucks because he finds something else wrong with the car. And you pay the six hundred, even though he didn’t tell you something else was wrong until the job was finished. I’m like the mechanic. Yes, we’ll get there in 2014/15 for sure. I am utterly confident of our meeting that target. I am of course using the Islamic calendar, and the year is currently 1436 AH. I’m sure we’ll get to surplus some time during the next five or six hundred years. And if we don’t I will resign. Yes, you can quote me on that. 11. We are the most up-front transparent Government ever. We could have hidden debts. We could have locked up earthquake repair money. We could have even mis-lead the people of NZ. The fact that we are so honest proves that we are excellent economic managers and the best to run NZ. 12. Ask yourself, do you think the people of Huntly are mildly interested in what the Opposition has got to say about numbers? What people are actually interested in is housing that they can actually live in and that will make a difference for them and the fact that people are getting off welfare and into jobs and that there is something better for them and their kids down the road, and that is what this Government is focused on every minute of every day. So stick with your sideshows and think that that is winning. 13. Surplus. It’s clearly just a slogan. You know, like “100% Pure NZ”. These are just words, not real things. Nobody really believes anything that politicians say. We just say things because that’s what you do. Ultimately, people should really listen to what we say or ‘promise’, they should just ask themselves, who would you rather have a beer with? Who says fun things about their cat? Who grins like an idiot and says funny stuff when people are being all stuffy and serious about running the country? That’s us. National. That’s why we’re awesome. 14. I’m optimistic that we are still on target to meet the surplus. The forecasts fail to take into account our plan to let Mom and Pop investors buy a piece of their very own Superfund. We’re planning to float 49% of the fund in February 2015 and expect to raise at least 2.5 billion dollars. In order to prevent foreign interests crowding out Mom and Pop investors, we have decided to use a closed registration process with minimum buy-in of 1 million dollars, this ensures it is a fair process for everyone. We can flog off the state houses to our friends and property developers at cheap prices, should raise 1 billion. We can cut hospital budgets (already done) – get rid of jobs in government, privatize Wellington council by calling it amalgamation into a super city and then sell off the council assets. (Now John Banks is being retried of corruption thanks to those hard of hearing US businessmen he could be relocated or Rodney Hide would be good). We can then put it into Mark Mitchells Mercenary funds when we keep people busy on the constant threat of Terrorism and invasion of Iraq. Lucky it is all bad news and after the US and UK and 13 years of fighting ‘terror’ the attacks seem to be getting worse. Great! Keep those greenhouse gases going so when Labour finally get in, the economy is so tanked they can blame it on them and keep their ‘record’ of managing the economy untarnished. Keep the compliant MSM in their pocket profiting from all the dirty deals. It’s great how the MSM don’t even realize with no middle and poor Kiwi’s buying their papers anymore, Brisco’s and Farmers and The Warehouse don’t really have any reason to advertise there so readership and advertising down. Make sure all the new immigrants pay donations to National to keep the party going. Farmland is so cheap here! We have Sky city to launder all the money! Gosh this state of NZ is just like the 1980’s but even worse! And Whinny must retire some time so no one left to keep anyone honest. And of course just like the 1980’s blame it on the evil beneficiaries. Note to self, cut their benefits even more just like the Mother of All Budgets! He must have got his inspiration for this one by listening to Abbott talk about breaking election promises. 15. We will enter into public/private partnership agreements to release the vast untapped potential of our under utilized real estate. Disney wants to turn Milford Sound into a water theme park. The US Marines want to lease 90 Mile Beach to practice amphibious landings. We have offers to sell the Auckland Domain for condominiums, offices, a shopping mall and six levels of underground Wilson Parking to solve Auckland’s parking problems. The Chinese Navy wants to buy Great Barrier Island because Port Fitzroy harbor is an excellent deep water port. Several drug companies have asked us to rent out our prison population for medical experiments but some Maori tribes are objecting. They don’t appreciate the importance of making money.